Thank you for checking out our blog. Internet access may be limited as we board our ship in a while, so we’ll have to see how that goes. I plan to post some photos later from Laodicea, Colossae and Aphrodisias, but for now I wanted to share some from Ephesus and Miletus. This is the theater mentioned in Acts 19, the site where thousands assembled and for 2 hours chanted, “Great is Dianna of the Ephesians!” This was in response to Demetrius stirring up the crowd as he saw the logical consequences of Paul’s preaching:  No longer would Dianna/Artemis hold her divine place of honor, but also  Demetrius and the other craftsmen would be out of the business of making the silver shrines and idols of Artimis, items that were purchased by people from everywhere as they made the pilgrimage to see the Artemis temple, one of the Seven Wonders of the World. The theater holds 24,000-25,000 people. 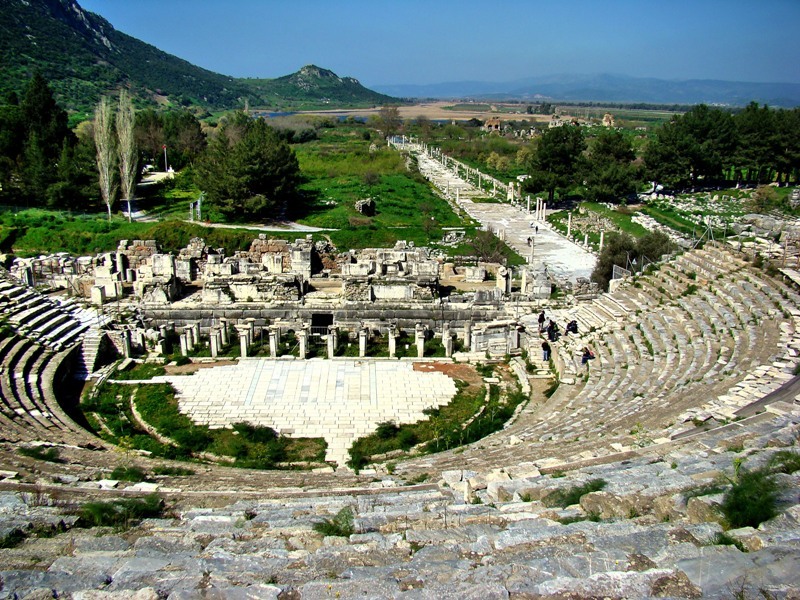 Ephesus Theater. View toward ancient harbor. Photo by Leon Mauldin. I thought I’d include another group shot. The location here is the famous library of Celcus, originally built in A.D. 110, by Consul Gaius Julius Aquila, in honor of his father, Gaius Julius Celsu Polemaeanus, governor of Asia A.D. 105-107. Some suggest that the school of Tynannus may have been located to your left (Acts 19:9). 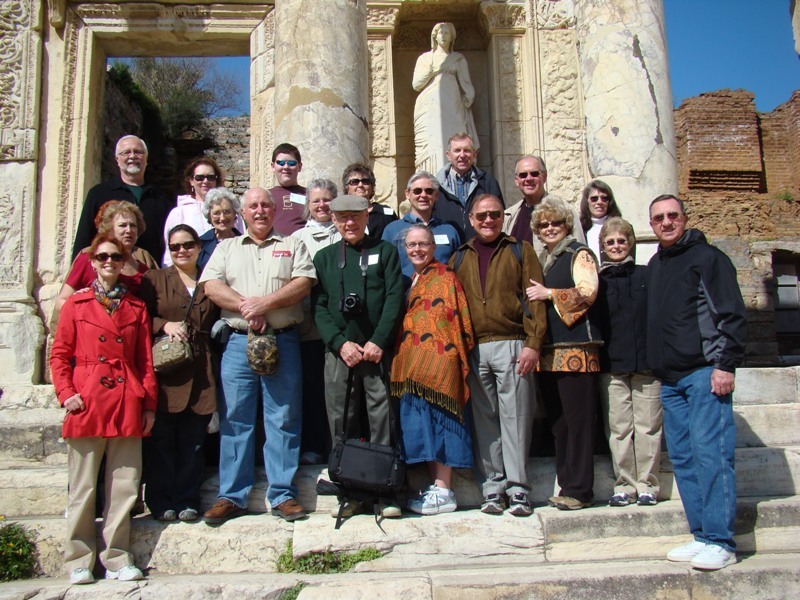 Group Shot Library of Celcus, Ephesus. Photo by Orhan. 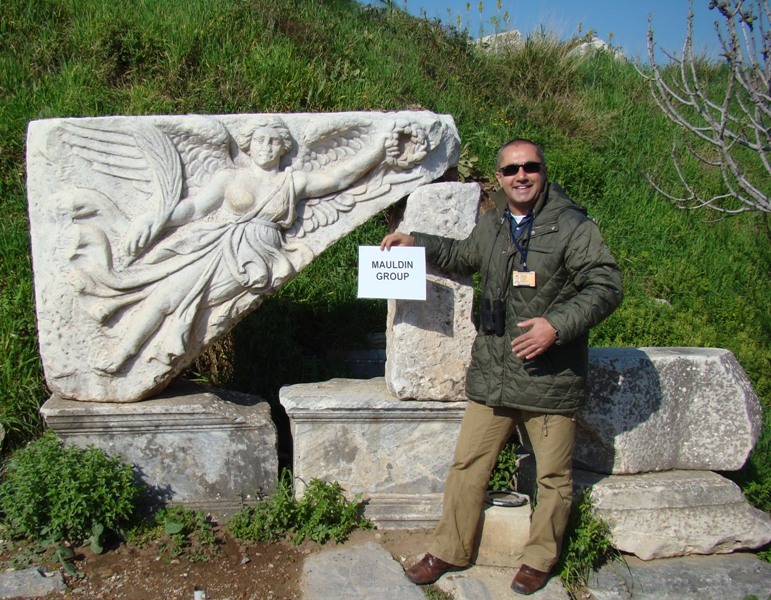 Everyone has enjoyed our guide, Orhan. He is leaving us today, because he is a Turk; when we board our ship we will be on Grecian territory. He is standing beside the goddess Nike, the mythical goddess of victory. 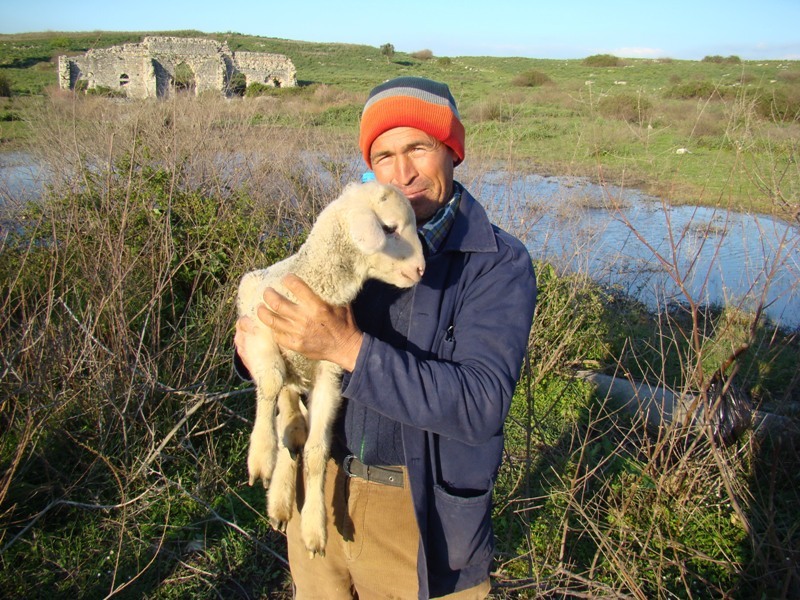 For the selection from Miletus I’ve selected a shot of a local shepherd with a lamb. It reminded me of texts such as John 10:7ff., where Jesus spoke of the care that the Good Shepherd has for His sheep. This entry was posted on Tuesday, March 16th, 2010 at 6:42 AM and is filed under Uncategorized. You can follow any responses to this entry through the RSS 2.0 feed. You can leave a response, or trackback from your own site. Enjoying following your trip. Tell Orhan helllo for us. Thanks for the work you do.